Der Artikel Charlie Haden (1937-2014): Nocturne wurde in den Warenkorb gelegt. + Gonzalo Rubalcaba,Ignacio Berroa u.a. Nocturne was the winner of the Best Latin Jazz Album GRAMMY at the 2002 GRAMMY AWARDS. Bassist extraordinaire, composer, bandleader, teacher, and GRAMMY® Award-winner Charlie Haden is no stranger to Latin music. It was Haden who, in 1969, founded the Liberation Music Orchestra, a visionary outfit that combined avant-garde jazz with both Spanish and Cuban influences. His new Verve release Nocturne demonstrates that the veteran acoustic bassist is capable of finding new things to say in the Latin realm. 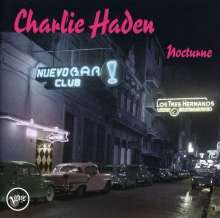 Produced with the acclaimed Cuban-born pianist Gonzalo Rubalcaba, Nocturne marks the first time that Haden has devoted an entire album to boleros-the sensuous, romantic ballads that have moved Latin America for generations. 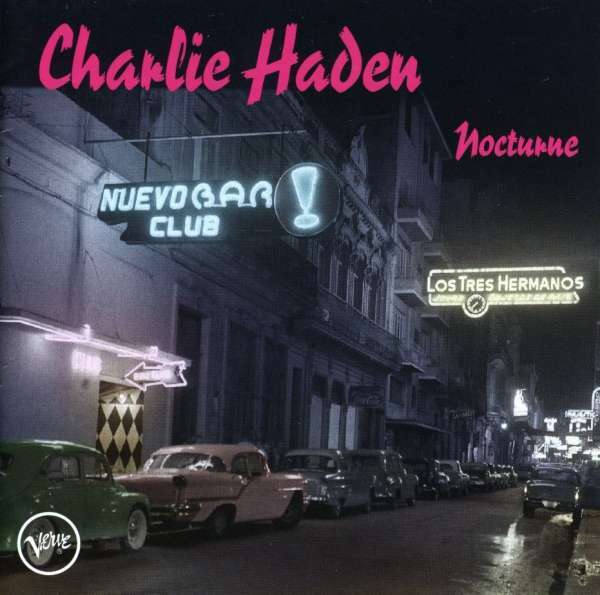 When Haden first started making plans to record Nocturne, he envisioned an album of American and Cuban ballads. The boleros of great Latino composers like Arturo Castro, Cesar Portillo de La Luz, Marta Valdes, Martin Rojas, and Maria Teresa Lara would be heard alongside the songs of George Gershwin, Cole Porter, Irving Berlin and other great American composers. But it occurred to Haden that, while those composers are famous in Latin America, they aren't as well known in the U. S. as they deserve to be-and he saw Nocturne as an opportunity to show non-Latin listeners how great their songs are. So on Nocturne, you won't hear anything by Jerome Kern or Gershwin, but you will hear Haden and Rubalcaba offering lush interpretations of Castro's "Yo Sin Ti" and Rojas' "En la Orilla del Mundo." You will hear guest Pat Metheny taking an acoustic guitar solo on Lara's "Noche de Ronda" and tenor saxophonist David Sanchez being featured on Valdes' "No Te Empeñes" and Osvaldo Farres' "Tres Palabras." Haden, who lives in Los Angeles with his wife, singer Ruth Cameron, explains: "I love boleros, and Gonzalo loves American standards, but there were so many beautiful Cuban ballads we wanted to record that we ended up concentrating on boleros exclusively." Nocturne's original compositions-two Haden pieces ("Moonlight" and "Nightfall") and Rubalcaba's "Transparence"-are perfectly at home with the time-honored Cuban and Mexican boleros that the jazzmen interpret. When Haden and Rubalcaba produced Nocturne, they carefully selected musicians who have both jazz and Latin credentials, including drummer / percussionist Ignacio Berroa, violinist Federico Britos Ruiz, and saxophonist David Sanchez (a hard bopper who is well versed in both Cuban and Puerto Rican rhythms). Featured on Lara's "Noche de Ronda," guitarist Pat Metheny's love of Brazilian music is well known. And the eclectic Joe Lovano-a broad-minded saxman who has never shied away from a musical challenge-brings his distinctive tenor sax to Rojas' "En la Orilla del Mundo" as well as "Moonlight," "Transparence," and a medley that combines Cesar Portillo de La Luz's "Contigo en la Distancia"with Tania Castellanos' "En Nosotros." For Haden and Rubalcaba, Nocturne is the latest chapter in an enduring friendship. Born in Havana, Cuba on May 27, 1963, Rubalcaba was only 23 when he first met Haden. The bassist recalls: "In 1986, my Liberation Music Orchestra was invited to play at the Jazz Plaza Festival in Havana. One of the bands that was playing was called Grupo Proyecto; Gonzalo was the pianist, and when he took a solo, my wife Ruth and I almost fell off our chairs. I met Gonzalo backstage, and we became very close friends. I wanted to bring him to the United States to play with me, although I couldn't at the time because of the embargo." Haden quickly became one of Rubalcaba's strongest supporters, helping arrange an appearance at the Montreal Jazz Festival in Canada in 1989. Haden sang the pianist's praises to Blue Note Records, where Rubalcaba signed in the early 1990s. In 1990 Haden produced Rubalcaba's first CD, Discovery: Live at the Montreaux Jazz Festival. Not surprisingly, Haden was Rubalcaba's first choice when, in 1991, he needed a bassist for his first Blue Note studio date, The Blessing. In 2001, Rubalcaba turns 38. But the acclaimed pianist wasn't even born when Haden first made his mark in the jazz world. Born in Shenandoah, Iowa on August 6, 1937, Haden moved to Los Angeles in the mid-1950s, and before long, was employed as a sideman by such West Coast heavyweights as saxophonist Art Pepper and pianist Hampton Hawes. It was in 1959 that he joined forces with one of jazz's most innovative-and controversial-musicians: alto saxophonist Ornette Coleman. From 1959-1961, Haden was a member of the trailblazing Ornette Coleman Quartet (which also included drummer Billy Higgins and trumpeter Don Cherry), where he revolutionized the concept of the modern bass. Haden's work with Coleman was an inspiration to avant-garde musicians, yet he was never one to be categorized. A highly versatile improviser, Haden is as comfortable with swinging hard bop and romantic ballads as he is with cutting-edge musical experiments. One of Haden's most ambitious undertakings was the very political Liberation Music Orchestra, which in 1970 recorded arrangements of songs from the Spanish Civil War as well as "Song for Che," an ode to the late Cuban revolutionary Che Guevara. Haden's acclaimed recordings with Egberto Gismonti from Brazil, Dino Saluzzi from Argentina, and Carlos Paredes from Portugal have also extended his work into the annals of Latin and Portugese music. Haden's romantic side asserted itself in 1986, when he formed Quartet West-a unique bop group that has celebrated the films, music, and sounds of the 1940s. Between songs, Quartet West often provides snippets of old 1940s recordings and creates a very nostalgic atmosphere. The group's original lineup included half of Ornette Coleman's 1959-1961 quartet; Haden and drummer Higgins (later replaced by Larance Marable) were joined by pianist Alan Broadbent and tenor saxophonist Ernie Watts. Quartet West's lyrical, atmospheric romanticism was most recently showcased on their beautiful 1999 Verve release The Art of the Song. And with Nocturne, Haden is once again showing us his romantic side-this time from a Latin perspective. P. Steder in Audio 6 / 01: "Charlie Haden am Bass firmiert zwar als Chef, Produzent und Stütze dieser Crew. Aber der Pianist Gonzalo Rubalcaba aus Kuba, inzwischen nicht mehr auf technisches Brillieren fixiert, ist musikalisch zweifellos wichtigster Mann: Die elf Stücke leben von seiner traumhaften Melodieführung, die Joe Lavano und David Sanchez am Tenorsax nachzeichnen."